A warehouse operative working in Waterford for kitchen seller is awarded €8,000 for ‘completely deficient procedures’ in implementing redundancy. Respondent company sells kitchens throughout the country-claimant a warehouse operative in Waterford branch-poor sales in Waterford branch-claimant’s position selected for redundancy-company invited applications for voluntary redundancy or career break-claimant offered position in Limerick-declined for ‘family reasons’-claimant signed RP50 and accepted redundancy cheque-advised of right to appeal-General Manager claimed company policy re redundancy was adhered to-no need to compile a redundancy matrix as warehouse was closing fully-another employee retained to complete an order-no evidence of financial figures for Waterford branch-claimant received verbal warning for an error he made-claimant claimed that warehouse did not close immediately-employees still working there-he could have been trained for alternative positions-Tribunal accepted that company was suffering losses-however, procedures for dismissal were ‘completely deficient’-awarded €8,000 compensation under Unfair Dismissals Acts, 1977 to 2007-redundancy sum already paid to be offset against the €8,000. An Abrekebabra supervisor, accused of consuming food on the premises without any record of the food having been purchased, wins €9,500 for unfair dismissal. Supervisor since 2006-given a number of verbal warnings-CCTV footage showing him consuming food-no record of payment-supervisor claimed he ‘forgot to pay’-attempted to pay next day-breach of trust-one month’s notice and dismissed-no letter to claimant confirming dismissal-supervisor denied receiving verbal warnings-agreed received written warning-direct conflict of evidence between parties-‘lack of proper procedures’ in effecting dismissal-no formal invitation to dismissal meeting-no investigation-no letter to claimant confirming dismissal-no opportunity to appeal-did not receive full notice entitlement-unfairly dismissed. A mechanic who left work because of ‘work related stress’ fails in his case for constructive dismissal; EAT says the ‘burden of proof very high’. The claimant, an administrative training and development co-ordinator, fails in her claim for unfair dismissal as a result of her redundancy. Employer, large multi-national engineering company-claimant responsible for administrative training and development co-ordinator role lending support to apprentice electricians employed by the company-organised internal executive courses in leadership management and skills enhancement-downturn in construction industry-large number of redundancies-claimant made redundant-company then advertised for 2 corporate human resource positions-company claimed claimant did not have necessary experience or requirements-paid her statutory redundancy and one month’s notice-also offered €10,000 ex-gratia payment-claimant declined to accept-claimant got massive shock at meeting advising she was to be made redundant-became emotional and did not speak at meeting-not allowed to retrain or accept another role-needed time to think about €10,000 offer-required to sign a waiver form-EAT had enormous sympathy for claimant-excellent worker-however, genuine company restructuring-genuine redundancy-no unfair selection for redundancy-respectful response by company to cross examination during EAT hearing-claimant traumatised by redundancy-may have affected her decision to accept ex gratia payment-claim under unfair dismissals acts fails-received her statutory redundancy entitlement-received her notice of termination-minimum notice and terms of employment acts claim fails also. A FAS community employment scheme worker wins her unfair dismissal case where her fixed term contract was not renewed. Employee with Council as part of FAS Community Employment Scheme-fixed term contracts-2 fixed term contracts-scheme ended-11 people had their contract renewed-claimant’s contract not renewed-dismissed on recommendation of line manager-EAT finds unfair dismissal-two further years’ work available-not offered to claimant-no reason given-claimant did not seek reason on dismissal-Tribunal directs reinstatement for the remaining two years. An employer loses his appeal against the decision of a Rights Commissioner to award €8,000 compensation to an employee in respect of wages under the company sick pay scheme due to the appeal being outside the 6 weeks allowed. Rights Commissioner decision 5th June, 2010-employer lodged appeal dated 22nd July, 2010-only received by the Employment Appeals Tribunal on 4th August, 2011-Payment of Wages Act 1991-appeals to be initiated within 6 weeks of decision-appeal not lodged in time-Tribunal has no discretion to hear case-Rights Commissioner decision affirmed-€8,000 awarded to employee in respect of wages due under company sick pay scheme. A secondary school secretary is awarded €9,850 for unfair dismissal due to the employer’s “highly questionable” investigation into allegations. Secondary school employer-claimant was full time secretary-number of versions of employment contract-claimant’s role to record and lodge school income-school’s power supply disconnected due to unpaid bills-unpaid newspaper-Principal became concerned about unpaid bills and stale cheques-issued warning to secretary-claimant granted leave of absence by Chairperson of Board of Management-claimant went to Australia-audit uncovered “unexplained and unaccountable absence of money” from school accounts-Principal wrote to secretary about “considerable discrepancies to accounts”-secretary invited to attend meeting-suspended secretary on full pay-secretary’s mother phoned principal-meeting attended by secretary, principal, accountant & others-disciplinary procedures invoked against secretary-another meeting requested-claimant denied stealing money from school-claimant had no access to office records to challenge allegations-EAT found unfair dismissal-accepted that there was discrepancies in school monies-audit found shortfall of €12,000 in school monies-legitimate questions to be asked-school not entitled to single out secretary-other people had access to the monies-accounting measures adopted by all members of staff ‘very slack’-was dismissal ‘reasonable’?-quality and extent of school’s investigation ‘highly questionable’-secretary had some responsibility-respondent failed to engage with process-enquiry flawed however-decision to dismiss not reasonable given it was based on flawed enquiry-€9,850 awarded to claimant for unfair dismissal. A child care worker who was dismissed for gross misconduct was awarded €19,000 because of “lack of proportionality” and “procedural unfairness”. Child care worker in creche-dismissed for “gross misconduct”-failed to observe incident involving bullying-2 older boys-sock in mouth-father wanted investigation-claimant might have been on a break-did not see incident-dismissed with immediate effect-boy’s father put pressure on manager-claimant was on a break for 15 minutes-creche procedures not followed-child put at risk unnecessarily-manager did not inform claimant that meeting was disciplinary-dismissed for bringing crèche into disrepute-claimant not advised of right to appeal-manager over-ruled company disciplinary policy-child’s life had been in danger-claimant shocked to hear what happened-did not realize her job was in jeopardy-had not worked since dismissal-dismissal procedurally unfair-lacked proportionality-awarded €19,000 for unfair dismissal. A construction worker who claimed he was unfairly selected for redundancy and/or it was not a genuine redundancy situation, fails in his claim for unfair dismissal. 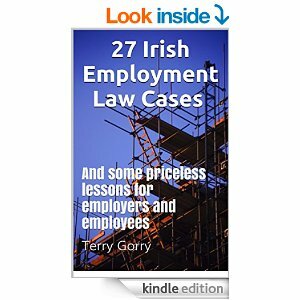 Long service since 1998-placed on 3 day week-told of redundancy-no appeal-requested copy of selection process-never received it-redundancy process should be last in first out-accepted sum of €5,000 plus statutory redundancy-earned €80,000 per year-claimant’s case that he was not redundant-or unfairly selected for redundancy-EAT finds redundancy fair-for unfair selection to apply there must be workers in similar employment-no recognised procedure with trade union in this case-last in, first out did not apply according to employer-no finding of unfair selection-genuine redundancy under Redundancy Payments Acts 1967 as amended-unfair dismissal claim fails.